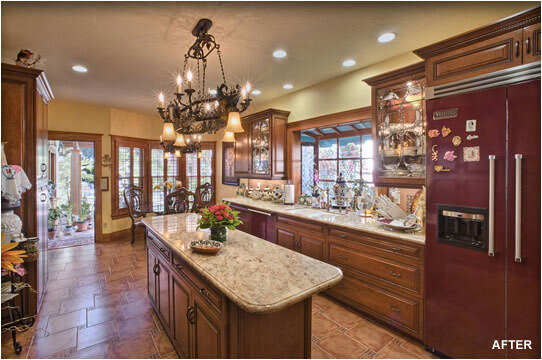 Latest Design Option 2-4, Kitchen » Roger Perron Inc. This is an open floor plan from the kitchen to the breakfast room and to the patio. The patio provides indoor-outdoor living for the owners, who enjoy barbecue and meals under the shaded pergola. The natural wide woodwork was a standard throughout the home remodel, which was duplicated for the kitchen remodel. The island is fitted with two seats at each end, a great place to sip wine and enjoy life. Design for this major remodel and additions with luxury floor plan in Alhambra was created by Roger Perron, design-build general contractor, with contributing architect for working drawings Curt Sturgill.